This is my “One Word” for 2017. This word called out to me at the beginning of the christmas season and at that time I thought it simply meant spending time with God. I normally spend quite a bit of time with God (at least I would like to think I do)! Outside of the usual prayers, devotionals, podcasts, church services, worship, Bible study groups books, etc; I take advantage of the little moments to speak/pray/listen with God as well: shuttling the kids to activities, getting ready for the day, setting up the cots at nap time, standing in line at the supermarket, etc. I know what it means to abide/remain/stay close to God. But I knew I needed rest. And I waited for a new word to come to reflect that. But nothing came. With just days left in 2016 here I am back to the original one word with it’s truer meaning. 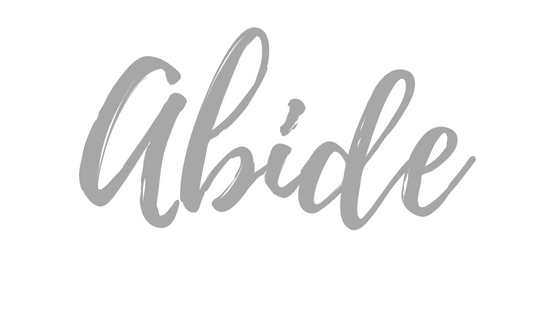 The parallel verse(s) found in John 15 says (in a nutshell): “Abide in Me.” And to remain inseparably linked to Christ in all areas of life goes much deeper than spending time with Him. Abide involves rest! There is truth, peace and rest in your true identity. Abiding in Christ is remaining in our God-given identity instead of focusing on what we do. He doesn’t want me to be busy, he wants me to be fruitful. We are His, cherished, loved, redeemed, set apart. He not only unconditionally loves us, but He likes us! It’s about waking up to the truth of who we are and Whose we are. Resting in His grace where we are always found worthy. He is the author and perfecter of our identity. Without Him, we are incomplete. What a delightful thought — God likes us I haven’t thought of that before. It makes abiding in Him even more intimate. Great word. I love the deeper meaning you found for abide. And that you initially fought the word, then came back to it with an increased understanding. You’ve inspired me to try to be more linked with God throughout my day. I LOVE your word! I am so not good at choosing one word to theme out a year. I was thinking maybe “seek” but I don’t know… I also love love and kindness and last year it was Cherish, I still like that! Love your choice though. You go girl! I love your word, I am still working on mine. It sounds like you have given great thought and have good meaning to this. I never had a word of the year before, I like the concept . Great choice and what a beautiful meaning for choosing! I’m still trying to find a word for the upcoming year, and will be sharing it as well. I love this ” He doesn’t want me to be busy, he wants me to be fruitful. ” People get confused by this concept. My word is yes! That’s a great word and something we could all stand to do on a regular basis. It’s one of those things we need to keep focusing on or it slips away from us. I love your choice for a word. I’ve never done the one word for a year before but I have been inspired all over the place so I think I shall for 2017. I wish you a beautiful year of peace, rest, and hope as you abide. Great word of the year. Mine is Fearless. I love having a word of the year.